The countdown to 2015 is on, and LasVegas is expecting a record of 340,000 visitors in this New Year's Eve, despite of a forecast of freezing temperature and snow. Aria, Planet Hollywood, Caesars Palace, The Venetian, Treasure Island and Stratosphere, in a 7 minute and 11 second synchronized show. 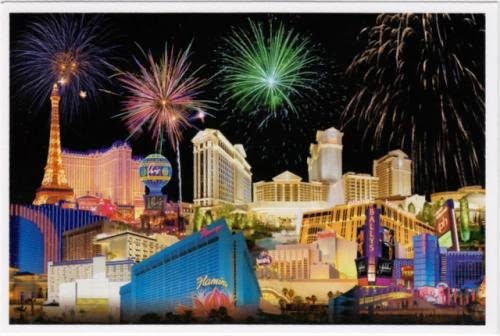 Postcard US-3087107 to China shows a collage photo that includes many major landmark hotels and casinos in Las Vegas under the fireworks. Update: The anticipated snow did not materialized. Only bursts of spectacular fireworks filled the sky, ushering in a brand new year. Fireworks from Planet Hollywood and Aria after countdown to 2015.